I can hardly believe it. To me, she’s still my glamorous mom, and I’m her little girl, trying to follow in her footsteps. When someone says, “Oh no, I’m becoming my mother!” – I laugh. But really there’s not much I would like better than to become my mother. Yup, the acorn doesn’t fall too far from the tree. And she told me a story recently that I had never heard before. When she was sixteen she got her first job. She worked in a department store, in Accessories, selling purses and gloves, and such. Can you imagine needing a salesgirl for gloves? But remember, this was 1940. Ladies didn’t leave the house without gloves. My mother was the child of Polish immigrants. They had very little money. They lived in a cold-water apartment with a toilet down the hall. My grandmother made all my mother’s clothes. 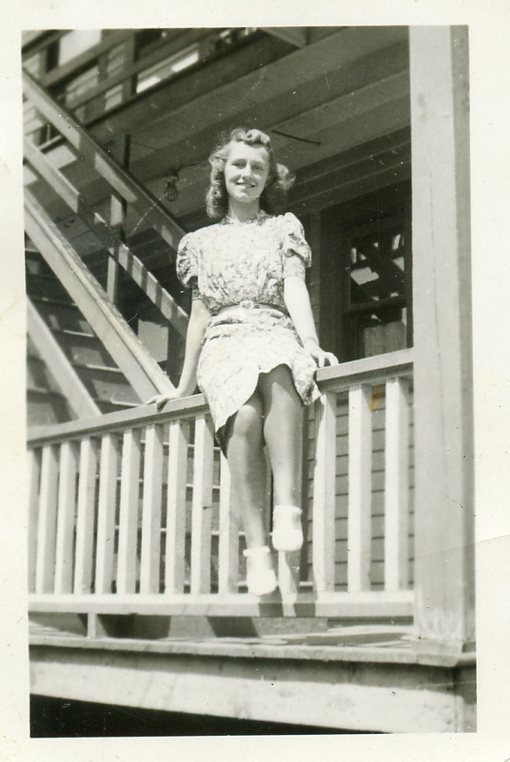 My grandmother was talented at the sewing machine, but I am sure my mother craved stylish store-bought clothes. This was Mom’s opportunity to buy great clothes at a discount. We have a lot in common. But of course when I worked in a clothing store, I had to quit. There were so many nice things, I owed them money at the end of the work week. I just couldn’t afford to work there. So Mom was excited by and proud of her very first job. And a few weeks into it, the weather turned very cold. On a windy day with a driving freezing rain, her boss told my mother to stand by the door and sell umbrellas. And she put on her coat (and her gloves) and went home. Like mother, like daughter, I thought. But that reminded me: My mother was a daughter too. YES! My DNA goes WAY BACK! Happy Birthday to your mom too! I love the way you write–I can identify with you so much. Thanks. My greatest desire is that my writing can make someone smile. Happy Birthday to your sweet mother! You’re so blessed to still have her in your life. I love the story about her first job. I am so lucky. She’s incredible! Happy Birthday to your mom. I bet she’s still glamorous. She is… Hair, makeup, jewelry, fashion – still tops on her priority list! Happy Birthday to your Mom. She sounds like a delightful woman. Such a loving tribute to her, so glad you still have time to spend with her. She’s bright and witty and loving. She’s my idol. Happy Birthday, Mom! She’ll keep you grounded. She’s Christmas every day. I can see her doing just that – walking away, that is. HAPPY BIRTHDAY AUNT STEFFI, MAY THERE BE MANY MORE! You know her well: She hasn’t got much of a temper, but she has a will of steel. “Polite but determined” may be a good description. Our mom’s were a lot alike – it took a lot to get either one of them mad, but when you did – stay out of their way…… I think we are both like our mothers, and as you said, I can’t think of anything better that either one of us can aspire to! The nut doesn’t fall far from the tree. There, I said it! True! But my mother and I are two happy nuts! I hope that I grow more like her every day. great story. I think I would have wanted to leave. not sure I would have had (or have now!) the balls to do it! Me either! But I am still trying to stand up for myself! You are so lucky you still have her in your life, and that she is willing to share her past with you. My mother LOVES to share stories and reminisce. And I never tire of listening to her. Perhaps that is why I am a storyteller now. Love! She sounds like a great gal, but you already knew that 🙂 Happy birthday to your foxy Mom! What a milestone, what a wonderful desire; to be like your mother. Glorious. I only hope to be like her. I have inherited her sense of style (thank goodness) but I don’t come close to having her sweetness. I’d say you have very good “genes” judging from the milestone and her common sense in quitting the job. I’ll bet that is were you also get your good taste for the skinny “jeans”. What a beautiful girl! And what a wonderful tribute to her. Happy Birthday to your Mom and congratulations on being just like her. Happy Belated Birthday to Nancy’s Mom — many more. Don’t you just love those old family stories? I do! Good or bad, scandalous or sweet, sad or funny… I never tire of them. I used to wear gloves and a hat to church. I liked it. I usually kept my gloves on during the service – hard to turn the pages in my prayerbook, though.